Made By Mossimo,Preowned And Still In Great Condition. No Rips Or Stains. Size 7 Juniors. 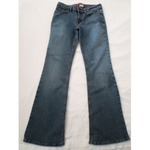 Measurements Are Inseam 30" Waist 14" Across 28" Around.There Are No Rips Or Stains. I do combine shipping. Please check my other listings and I am happy to give shipping discounts on any multiple winning bids. Once payment is received I ship items the next business day. Items will be shipped via USPS with confirmation and tracking number. If there are problems with my items, please contact me first so we can resolve the issue(s) before you leave feedback. I inspect and wash (If needed) each item prior to listing. In my photos I list any imperfection, but I am human and may miss something but will work out with you. Feedback: Please Leave Feedback Once You Receive Your Item In Satisfactory Condition. I Leave Feeback Once Feedback Is Left For Me,This Lets Me Know You Have Received Your Item In Satisfactory Condition. Payment: I Expect Payment Within 3 Days Of The Close Of Auction Unless Other Arrangements Have Been Made. I Prefer Money Orders But Also Accept Paypal. I DO NOT Accept Personal Checks,SORRY! Item Is Shipped As Soon As Payment Has Cleared. I Contact All Buyers After I Have Printed Your Label And Do Provide My Buyers With A Tracking Number. 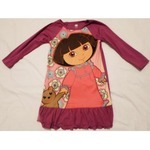 This Is A Super Cute Nightgown From Nickelodeon. It Has Dora On The Front. The Nightgown Is Purple In Color. Size 6. In Excellent Used Condition.